My exercise program/fitness plan consists of a 30-minute walk almost every morning. I say “almost” because I miss a morning now and then. Winter time is the most challenging for my early morning walks. It’s SO easy to just snuggle down in those covers, rather than climbing out of bed and bundling up to head outside to face the cold. Motor Man took these pictures of me returning from my walk on a recent morning. 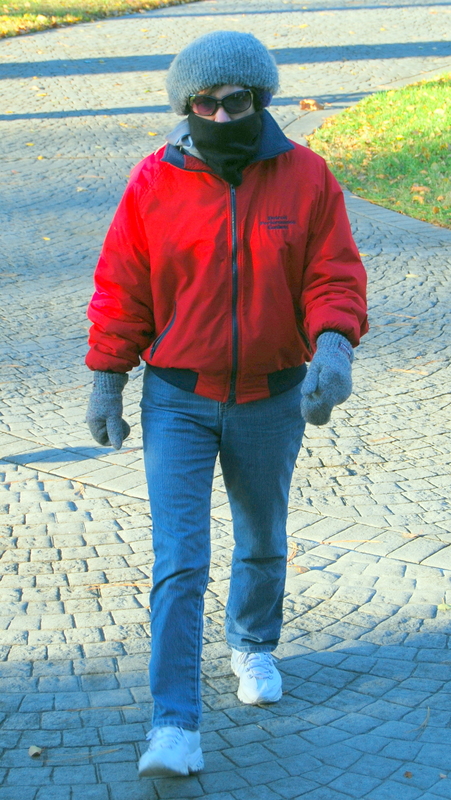 Now – you can see the hat, the mittens, the “cowl” that I pull up to cover most of my face, and of course, the jacket. And I bet you’re wondering what brand-name fitness- wear jacket I’m sporting. Don’t tell anyone: the insignia is “Detroit Performance Gaskets”. It was a promo item that Motor Man was given years ago. And it is a very warm jacket. I’d rather my neighbors not know, though. I like for them to think I’m on the cutting edge of fashion. 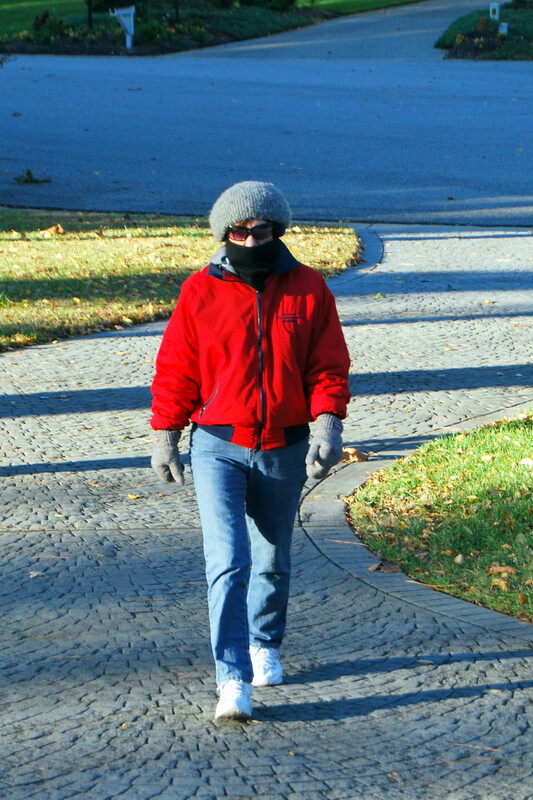 On this particular morning, the wind chill was only in the upper thirties. When the wind chill drops to the twenties, or — heaven forbid — the teens, I look pretty much the same as in this picture, but there are extra accessories that aren’t so noticeable. 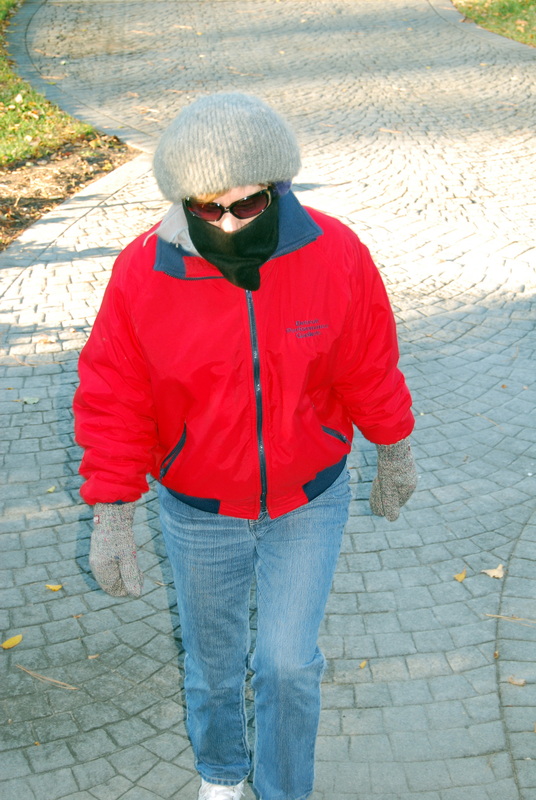 When it’s REALLY cold, in addition to the obvious clothing, there are also insulated gloves to wear inside my mittens, insulated socks to wear under my other socks, and ear muffs under the hat. And – Cuddl Duds, which are a girly version of long johns. I also have my cell phone, and a keychain with a siren in case someone should accost me. And looking like this, could you blame ’em? Motor Man tells me, with all those layers of clothes, if I should happen to trip and fall, I needn’t worry.